I know for many parents snack time can be stressful. You’re tight on time, you’re trying to balance life and work, you’re working hard to do the right thing for your kids and that’s exhausting. I get it, trust me and I’ve got a solution! It’s called planning – it’s truly the key to successful snack time – for you and your child. Planning ahead means you’re prepared, which hopefully relieves some of that stress. Part of this planning involves sitting down with your child and making a list of their favorite foods. Hear them all and write them all down, even the not-so-nutritious foods, because you can use those as inspiration for more nourishing snacks. Now that you’ve got your list, start combining things that work. For example, your child loves crackers and cheese. Lucky you! That’s a great, nourishing snack that’s easy to make! See how planning just made your life easier? Who says you have to make the snack all of the time? You don’t and you shouldn’t! Instead, it’s you’re responsibility as a parent is to teach your kids the great skill of being confident in the kitchen. During the weekend, discuss (maybe at the family dinner table) what kinds of snacks your child would like during the week. Take them to the store, have them help you pick out those items. When snack time rolls around, give them 2 snack options to choose from, then pull out those ingredients for them or have them get the ingredients themselves. Set your kids right up at that kitchen counter, roll up their sleeves and help them make that snack. If you don’t have small bowl, plates and mixing utensils, now would be a great time to make that small investment. Kids have great ideas and creativity. Don’t squash it, instead, embrace it! Use their enthusiasm to help them create new, fun snacks. Have them use cookie cutters or a rolling pin to create their special snack. Let them smash, mash and have fun making their snack. This involvement makes them feel empowered and more likely to enjoy what they’ve created. Speaking of snacks, have You tried Simple Mills crackers yet? As I mentioned above, I’m super excited to be partnering with them on this post. They’re a brand I’ve come to know and love. Their products not only taste good, but their ingredients are just like their name implies, simple. That means a lot to me as a mom and dietitian. And I’m really digging their line of Sprouted Seed Crackers which are made with nutrient-dense ingredients including a high bio-availability sprouted seed blend. They’re high in ALA Omega-3s & a good source of Vitamin E and Manganese. And what’s more – they’re also Certified Gluten-Free and free of grains, dairy, soy, corn & artificial colors, flavors & preservatives! Where can you find these crackers? Well, Simple Mills is happy to announce their products will be available in Meijer stores! That’s right! So while you’re doing your other shopping, you can pick up a box of their delicious crackers! 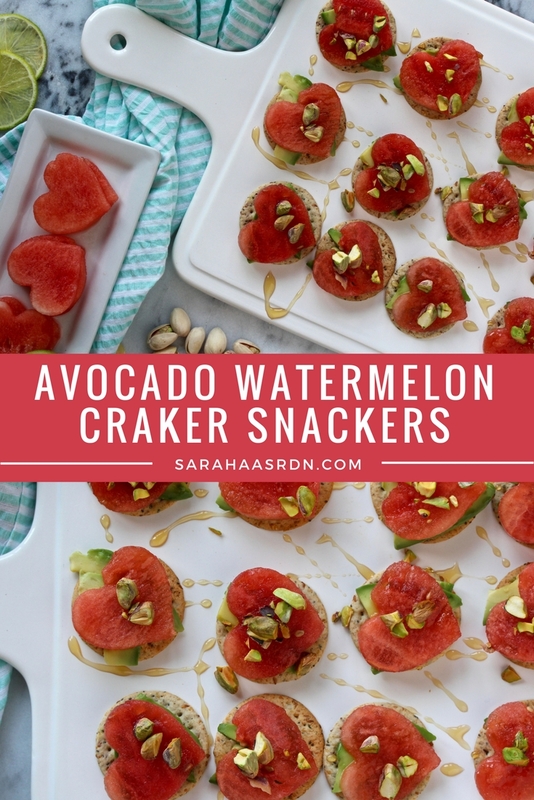 In fact, pick up the ingredients for these delicious Avocado Watermelon Snacker Crackers while you’re there! A simple after school snack that your kids can help you make! 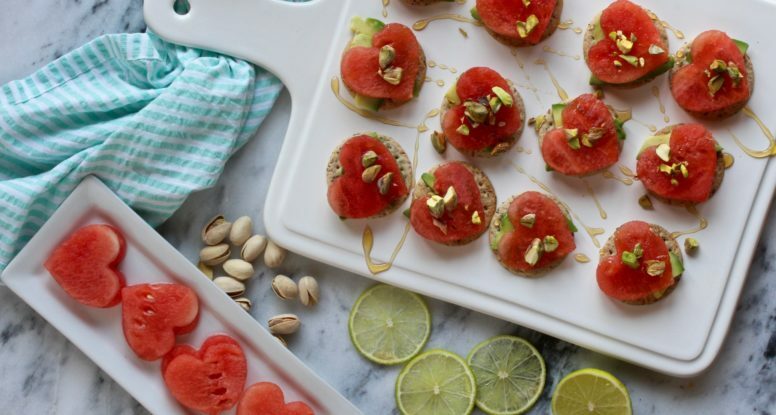 These Avocado Watermelon Snacker Crackers are a nutritious way to satisfy any hungry belly. For the watermelon: Cut the watermelon into 1/4-inch slices. Using a small cookie cutter, about 2 inches in size, cut the watermelon into shapes, no bigger than the crackers, you should get about 32 pieces. To make the cracker snackers: Place the sliced avocado on crackers, sprinkle lightly with salt. Top with watermelon cutouts then drizzle with honey and garnish with chopped pistachios. Kid Tip: Have your kids make the watermelon cutouts while you slice the avocado. They can also help with assembling the cracker snackers. Cooking Tip: Don’t have watermelon? No problem, swap in another melon or fruit of your choice! I like these with cantaloupe or even mango slices! How cute are those watermelon hearts?! 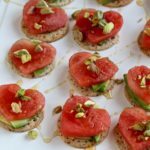 I love the idea of combining watermelon and avocado.. and great tips for making the most of snack time! Thanks Kara! Hope you get to try them! What a creative snacks! I love this! Never would have thought of topping with watermelon and avocado – but it actually sounds good. Thanks so much! It does work! I hope you’ll give them a try! Could these be any cuter and more kid-friendly?! So glad I found these snacks- thank you! Love getting the kids involved in the kitchen. Cute snack, too! I’ll have to try it! Me too!!! Try and let me know what you think! Thanks so much! They’re so much fun to make! These are so pretty. It would be great to bring to party!